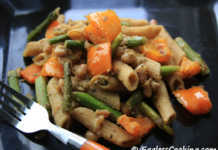 This is yet another low fat pasta recipe from the book 1001 Low Fat Vegetarian Recipes. Earlier I had prepared the Curried Pasta and Vegetables from this book. This pasta dish is also very simple to prepare, healthy without heavy sauces and cheese, but at the same time very flavorful also. Cook pasta according to the package directions. I didn’t have a tall saucepan to cook the spaghetti, so I broke it into half. I cooked it for 8 minutes and it had the perfect texture. Saute peppers, onions and garlic in oil in large skillet for 2 to 3 minutes. Add water; cook covered, over medium-high heat until soft, 2 to 3 minutes. Stir in sugar; cook, uncovered, over medium-low heat until mixture is very soft and browned, about 20 minutes. 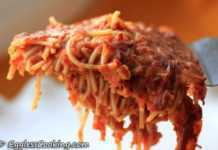 Toss with spaghetti; sprinkle with cheese if desired. I have cooked whole wheat penne pasta (Asparagus and Lemon Pepper Pasta) earlier and it clearly tasted different than it’s white counterpart. It took quite sometime to develop a liking for the whole wheat taste. So I was expecting the same with the spaghetti also, because I have not tasted whole grain spaghetti before. But I was totally surprised because it didn’t taste like anything I expected. It was really good. This pasta is made with 51% whole wheat and other whole grain flours, so you can enjoy the benefits of whole grains without compromising the taste. It’s an excellent source of fiber and protein. Don’t be tempted to omit the sugar in this pasta recipe because it makes the vegetables and the onions to caramelize and that in turn gives a nice flavor to the dish. If you think that the dish is sweet, you can spice it up at the end by adding black pepper powder. If you have some left over peppers, try these chili fries. Unlike other fritters which use all purpose flour or chick pea flour for the dipping batter, this recipe uses whole wheat flour. I also added some rice flour to make it crispier. Previous RecipeWant some cookies for breakfast? Next RecipeServe these cupcakes for dinner! How much sugar is needed in pasta recipe? Just a pinch should be enough. Oh! Thanks for letting me know. I guess 1/2 a teaspoon should be sufficient. 3-4 servings if I remember right. Thanks a lot for this wonderful recipe Madhuram. I tried it, it turned out very delicious. Hi!! Awesome recipe!! I would like to give it a try. But you seem to be missing how much sugar we should add. Let me know!! Gayathri, thanks for bringing it to my attention. You can add about a teaspoon of sugar. Hai, first time here…you have nice space. All ur recipes sound nteresting to me. Awesome pictures. Madhuram, What a delicious and colorful dish. Pasta recipes are always welcome because of the ease and convenience they offer on weeknights. Thanks! He eats plain cooked pasta without any sauce, vegetables etc. He really liked the whole grain spaghetti very much, he ate quite a lot. 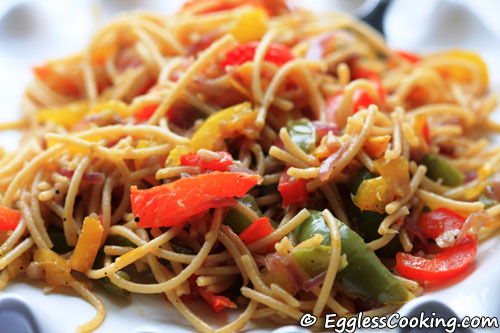 I have whole grain spaghetti all the time and I for one do not find it any different from the regular one, so that is the only one I use these days….loved this pasta dish looks so delicious will definitely try this soon ! its great you could visit me, madhu! i was busy with family visiting from india and all…now just a bit busy with the holidays, thats all. will be back to active blogging soon! !hopefully, u have noticed that i am hosting an event “Santa’s Holiday Challenge”. I sincerely hope that you’ll send in one or more of ur great desserts!! wow.. looks delicious & tempting.. nice click..
Madhuram, that’s so true.. I’ve found that whole wheat spaghetting tastes really good and one really can’t tell that it is any different from the usual white pasta. The dish looks so colorful and delicious.